Ask fellow campers about "Digby Campground" and nearby attractions. C$40 + tax, cash or debit card only. Nice fellow, very accommodating. Site level, gravel with grass. The best, fastest park WiFi we've found in Canada or the U.S. (we've stayed in 350+ CGs since 2014. We camped at Digby Campground in a Motorhome. Handy to Walmart, Sobeys and others. Digby is a nice little town. This is a nice park within walking distance to downtown Digby. This is our 2nd stay at this park. Wifi worked good as did electric and water. Laundry facilities were fine and pool was clean and well maintained. The reasons for the "average" rating is that the manager told us he could not open a 2nd exit because he has lost the key to the lock. The main driveway is very large and has easy access to the dump station but also requires driving out of the park on a blind corner and is somewhat dangerous pulling out of the park. The 2nd exit is a much safer way to exit. Since the manager indicated he lost the key a while ago I do not understand why he has not cut the lock and replaced it with a new lock and key. We would stay here again and hopefully the lock will be replaced. 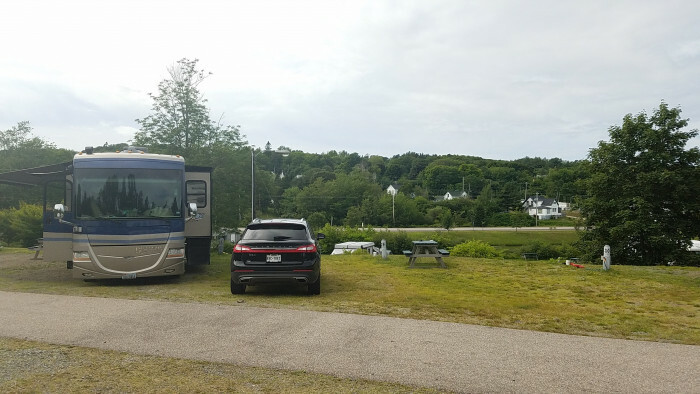 We camped at Digby Campground in a Motorhome. Easy drive to Annapolis Royal and Port Royal and about an easy hour drive to Brier Island for whale watching that was excellent. Annapolis Royal and Port Royal are very interesting. Ask directions in the office for the fresh seafood market. Great fresh scallops! The best part was the obliging lady at reception. We had possibly been spoilt with the value received in New Brunswick. Digby was effectively 40% more expensive than a camp on the Fundy Trail,and the facilities were old and tired, although clean. One shower for the entire camp, minute and you still had to pay extra for the use thereof!! Would not be inclined to recommend. We camped at Digby Campground in a Motorhome. This is a very nice small RV park. Very convenient to Digby, Port Royal area, and driving down the Neck. Staff was very friendly and helpful. We had a full hookups and power was OK. Wi-Fi worked good except when the park was full then it was a little slow. We did not use showers or restrooms. We would stay here again. We camped at Digby Campground in a Motorhome. One of the nicest parks we've had this season. Very friendly owners, all utilities are strong and good, excellent Wi-Fi, and excellent recycling! Big rigs are fine - our 38' rig had no problem. We camped at Digby Campground in a Motorhome. Attractive little camp ground terraced into the side of a hill. Some of the sites have a view of the water in the distance. Very convenient to St. John Ferry and Digby. The upper level has the full hookups. The space is very limited. We were unable to put out our awning because of the proximity of the motorhome next to us. The Wi-Fi is pathetic. Very weak and slow. Would like to try another camp ground in the future. We did not use the facilities. We camped at Digby Campground in a Motorhome. We stayed here for 2 nights. It was very convenient to the town of Digby and some nice restaurants. The campground is small with only 48 sites. We had the only pull-through site they had which was on the top of the hill. All the sites are very level but it would be difficult to bring a big-rig into the campground. The sites are open and most are not shaded. At the time, there were only six in the campground so it was nice and private. The owners live on-site and are very helpful and friendly. The bathrooms/showers are older, but clean. Showers are $1 for 5 minutes. There are 2 washers and dryers on site. Make a point of eating scallops while you are here and maybe doing some whale watching. The scallops are great. We got good satellite TV reception and the Wi-Fi was fast. We would come back again. 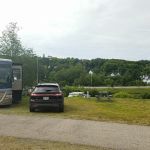 We camped at Digby Campground in a Travel Trailer. Campground is very convenient to Digby and we were here a little late in the year so it wasn't full. If full, it would probably seem quite crowded with the spaces on top of each other. That being said, it was a nice stop, with friendly owners, and suited us well for exploring the local area. Wonderful scallops can be purchased in town, and a good farmer's market on the weekends. Nice area to walk the dog, too. We camped at Digby Campground in a Motorhome. This is a small campground, and although it is basic, is terrific. The owner/camp hosts were two of the nicest, most accommodating people we've met. They were just great to us, and saw to it that we had the perfect spot for our needs. They were also very helpful in setting us up for a whale watching tour, and giving us suggestions for good places to eat in Digby. The campsites are wide and roomy, with lots of grass space in between. Our site was level, and most of the others looked the same. W/S/E Services were strong and worked fine. We were at the end of the park, and got a good Wi-Fi signal most of the time. It seemed to drop out at night, but return in the morning. There is a sweet little swimming pool, and a miniature golf. And, there is a walking trail behind the park that was great for the dogs, or taking a walk into digby. Wish there had been a fenced dog run in the park, but not so lucky as that. There is no camp store to speak of, but shopping is just minutes away. The Bay of Fundy is right outside the campground, and it was fun to see the tide go in and out twice a day. Very dramatic. We didn't use the laundry or washrooms, so I cannot comment on them. If you don't need a lot of bells and whistles, you'll be happy here. We were here for 4 days and would definitely return. We camped at Digby Campground in a Motorhome. The two camp hosts here are probably the nicest we have ever met. When we told them we wanted to do a whale watching tour (famous on Digby Neck) they immediately got on the phone and called several to see if they could find us a reservation. Really above and beyond. This location is wonderful for eating Digby scallops (famous) and doing a whale watching tour. The town is very close. It's a bit of a drive for the whale watching tour but so worth it. We must have seen 2-3 dozen whales (mother's with babies). It makes some of the other tours we have done in the U.S. look like a joke. The only reason they did not get a 10 from me was because we never could connect to their internet. In Canada we were always hoping to be able to contact family even by email and we were unsuccessful here. We camped at Digby Campground in a Motorhome. I agree with everything in the previous review. 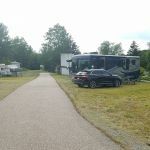 We enjoyed Digby and Digby Campground is the perfect place to stay while seeing the area. We would stay here again. 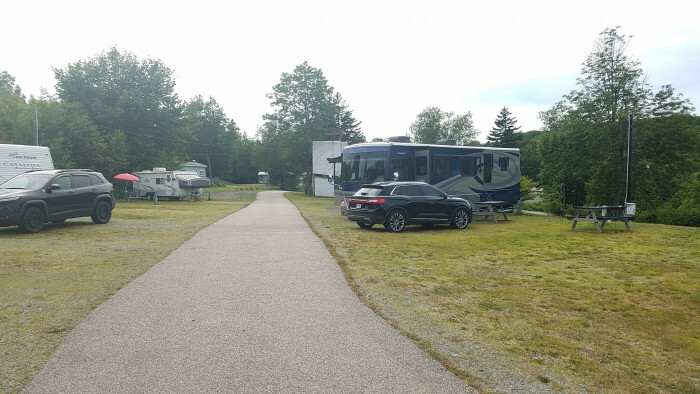 We camped at Digby Campground in a Fifth Wheel. There is a mixture of 20 and 30 amp sites, advise reservation. Sites are basically open for satellite and level. Wi-Fi is very spotty, but isn’t that the fact at most parks. The finest feature is a pleasant 10 minute walk through the woods into the town of Digby, and a close second is the very friendly owners. Nothing fancy about this place, but would definitely stay at this small campground again. We camped at Digby Campground in a Travel Trailer. Great place to stay in Digby area. Owners are very helpful. Convenient location near Bay ferries and Annapolis Royal; fairly level grass sites; no breakers on shore power hookup; didn’t use facilities but they looked fairly clean though old. We camped at Digby Campground in a Travel Trailer. Are you affiliated with Digby Campground ?